The trees have started to turn here, but fall foliage is not yet peaking in the Massachusetts Berkshires. Now is the right time to plan a trip here during peak season. 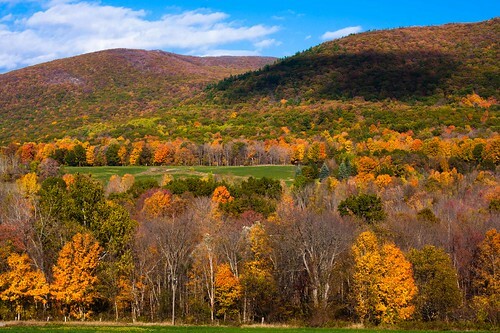 Our Berkshires Bed and Breakfast tends to fill in October, when the surrounding forests are decked out in dazzling reds, oranges, and yellows. Plan now to be here then. There is nothing like autumn in New England. Driving down country lanes is a wonderful way to see a lot of trees. Spreading a picnic blanket under a large maple is a delightful way to drink in an autumn afternoon. But those who can delve deep into a New England forest during the peak of foliage season are truly fortunate. Berkshire Horseback Adventures leads trail rides through nearby Kennedy Park and up Lenox Mountain. To experience New England foliage from the back of a horse is magical. The scent of the horses mixes with the woody odor of fallen leaves. The crisp air magnifies the sound of the horses breath, his feet clipping along the trail. Leave New York, Boston, and Hartford behind and drive west like a cowboy heading into the sunset. Spend a few days at our Bed and Breakfast in the Berkshires this autumn. While here, treat yourself to a trail ride. It is sure to be one of the most memorable events of the year. More information about trail rides may be found at Berkshire Horseback Adventures.